Have you ever tried bringing plants inside your home or placing them out on your garden using different kinds of containers? You probably have but have not been too conscious of how to prepare it the right way. Container gardening can be very beneficial in a lot of ways. So if you happen to have a very spacious garden (an area that you’re too lazy to fix but would still want to have plants around), or live inside an apartment or condo unit (an area that has no yard space for use), then you can definitely do some container gardening at your very own convenience. Container gardening ideas blossomed from when people finally had the need to grow organic stuff in spite of the restrictions in space. Planting different kinds of natural stuff (like herbs, vegetables, flowers, and other kinds of plants) stemmed from this need to still do some gardening regardless of the area that’s open for use. Gardening using nothing but containers are also useful especially when you want to maintain the condition of your soil. Whether you’re into some flower, herb or container vegetable gardening, the material for which you will plant and store these should have a good drainage system. You can choose to use an array of containers such as plastic bins, baskets, toilet bowls or broken bathtubs (anything that will help hold in your organics), but you will always have to take note of the drainage factor. You can always place your container gardens where it can be easily accessible to you like the roof deck of your condo building, by your patio (should you own a large garden space at home), or by any windowsill (this can be in your kitchen, bathroom, or wherever). The areas to place these containers are endless despite of having a limited space at home. As an alternative to planting your organics under the ground, you can fully concentrate on the containers itself especially if these were houseplants (for indoor container gardening). When growing different kinds of plants, you also get the chance to nurture these with some well-preserved soil. When the soil is of high-quality, then you can be assured that your plants will grow free from diseases. Other than that, when you do this kind of gardening, you’re also eliminating the possibility of weeds cluttering your garden. Apart from that, you are also given the chance to move your containers around, should the need arises. You can also get real creative with container gardening vegetables, or with any other plant type. And with this type of arrangement, container gardening can make a monotonous looking garden a beautiful and calming place to visit everyday. Get yourself our 100% Organic Planter Container for only $7.99! 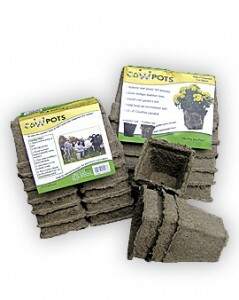 Our Cow Pots are the best plant containers that you can ever start with. Aside from that, our Cow Pots have been made from a natural and renewable source. So order yours today, and reap the many benefits to gardening with our pots! To know more about the product, check the Cow Pots here. This entry was posted on Thursday, January 13th, 2011 at 6:28 am	and is filed under Gardening. You can follow any responses to this entry through the RSS 2.0 feed. You can leave a response, or trackback from your own site.